The S3DA100K12BT18 is low noise voltage DAC that is ideal as a static or low speed transient reference for low-noise applications. The voltage DAC is implemented using advanced R-2R network with optimized performance on MSB switching to prevent non-linearity issues. 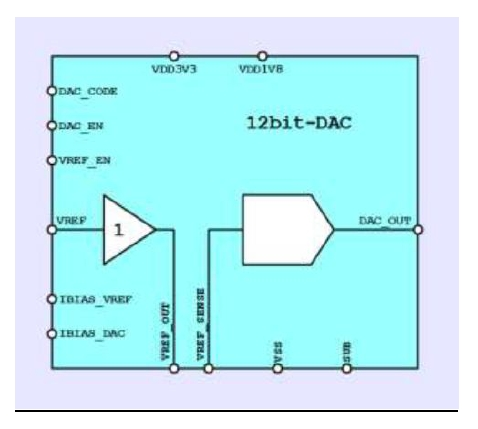 DAC resolution is 12 bit and maximal range is from 0V to twice the Vref voltage, so it is configurable and adaptable for required applications. Input reference voltage is buffered so it does not load the reference generator and the buffered reference voltage is available for the final application. Main feature of this DAC is low noise performance. This is achieved using low noise techniques in combination with filtering using the off-chip capacitors. Although the DAC can operate with any suitable voltage reference, it requires S3BGN3T18 to guarantee the low noise levels. The S3DA100K12BT18 can be cost-effectively ported across foundries and process nodes upon request.